In memory of the September 11, 2001 terrorist attacks, in which nearly 3,000 people were killed, the United States observes Patriot Day, which is also called the National Day of Service and Remembrance. On this day, the American flag is flown at half-mast at individual homes, as well as at the White House and government buildings, both in the U.S. and abroad. The president also encourages all Americans who are able to volunteer for service opportunities on that day. In that way, the victims of 9/11 are remembered so we, in turn, can honor them. 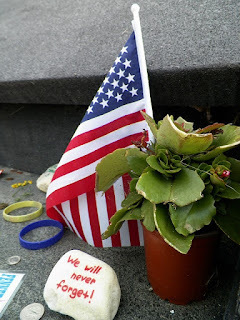 What are your remembrances of September 11, 2001? Please share your comments below. Our Facebook party is Tuesday, September 27th. Please join us for a fun event! 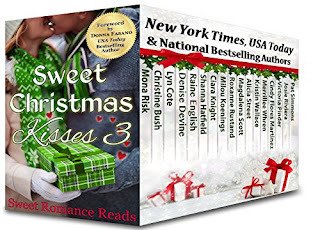 And, our Sweet Christmas Kisses 3 boxed set is available for pre-order now! I remember the overwhelming fear & sorrow. Could not stop crying for days & was glued to the TV coverage. I remember the fearlessness of President Bush & Mayor Giuliani I remember all the grieving family members posting pics of their loved ones. I remember praying the rosary & going back to Mass. I remember all of the volunteers digging thru the mountains of ash & rubble. I remember the blessed priest who was killed by one of those who jumped to their death over suffocating or burning alive. I remember all the survivors who were flooding the streets covered in ash as the towers fell. I remember how we feared that there were more missing planes yet to attack when I could not reach my daughter attending Emory University in Atlanta where the CDC is located. I remember the fearlessness of all the first responders, especially those who died trying to save more people. I remember all of the souls loss to soulless Islamic terrorism & all of those new angels released to heaven in sorrow. I remember the pride & unity in America which still sings in my heart & soul today! Daphne, Your remembrances are beautiful and heart-felt. I,too, experienced many of the same feelings that you experienced. Thanks so much for sharing. Thanks! I am trying to understand how to copy it to my FB....still no luck! Daphne, That's OK if your Facebook post was unsuccessful. Your post was one of the saddest and most beautiful I've ever read. Thanks & Blessings to you, Josie! Ginny, You gave your co-worker strong and true words. Our nation did stand together. I was sub teaching in a middle school special education resource room when the news came down and we had no idea how to explain to our student why some of the teachers and staff were crying. Nor did the principal want us to tell them anything telling us to just tell them 'something horrible happen in New York and their parents would explain it to them when they got home.' I was also working as manager of a children's entertainment center and we were told by the owner that per the president we were not opening to the public but we still had to come in and do the required maintenance like we normally did. Since my sister was told she had to stay at work as she was an nurse in case something happened in our area (Chicago) i took her three oldest children with me 10, 8 and 6 and allowed them to play the games and had no idea what to really tell them about what had happen other than to tell them we were safe. Only later did I learn that a friend from college had close friends on the pentagon plane, so today I always give a special thought to that family. (Dana, 3, Zoe, 8 and their parents Charles Falkenberg, 45 and Leslie Whittington 45). When I got home later that evening I couldn't even watch the tv or radio as the whole thing just made me sick. I remember when the students returned to school their questions and the fear that they had and tired to reassure them and my own nieces and nephew that they were safe and protected but not really knowing myself if they really were. That when we reopened the complex reassuring the staff that they could safely come to work. The fear my family had since we were in direct flight path of two major airports and two small private ones that were we really safe and the concern for friends and family who had to go to work in downtown Chicago. I remember hearing about the brave first responders who rushed in not knowing what was going on and the civilians who stepped up to help out and that some never came out alive. I remember watching the search dogs and their handlers which slowly became cadaver dogs and the pain just etched on their faces and how people and dogs just looked to tired and hopeless. Such a sad and poignant remembrance. I remember being glued to the television for weeks. Many, many thanks for sharing. Thank you for sharing this, Josie. So important to remember. I was in the car, driving to work when I heard the news. Seemed so surreal at the time. I remember that morning so well, also, Shanna. I was teaching a piano lesson and we all stopped and rushed to the piano studio waiting room, where I had a small TV set up. I was watching TV when they said a plane had flown into one of the twin towers. When I saw the second plane fly into the other tower, I knew it wasn't an accident. I remember watching and thinking it couldn't really be happening. Thanks for sharing.